the adventures of tartanscot™: "Please, Do Not Disturb . . . "
Love the tartan bedroom of yours. That is by far my favorite! To have a gorgeous bedroom such as these. Only in my "dreams". I adore your bed. How chic! There is something to be said for the drama of a four poster bed! I love Charlotte Moss' version and your own....extremely inviting and embracing. The colors are divine! Hope you will recover soon! To bed, hot tea, some toast, the cat at your feet and a good read!!! I love your bedroom! Looks like a cozy place to stay in bed and watch old movies and sip tea. by Phoebe Howard. It is so clean and bright. As much as I love Charlotte Moss and Miles Redd AND SMW, waking up in the Phoebe Howard room would be a great way to start the day! 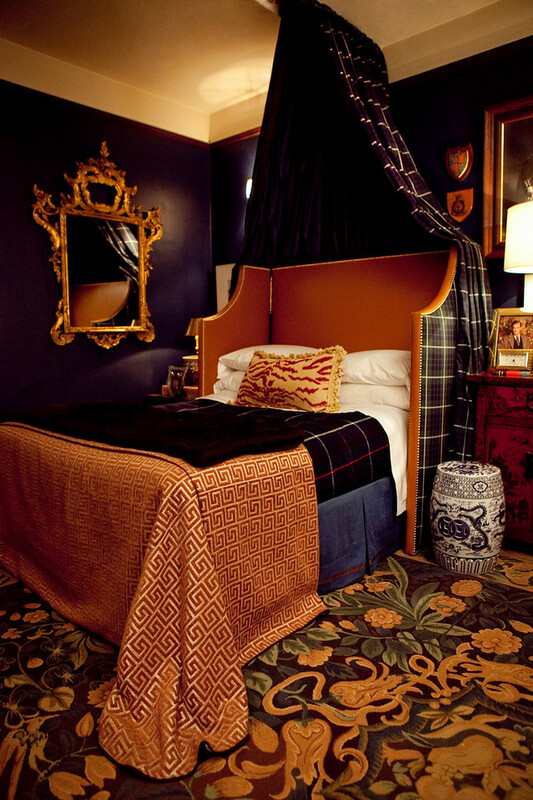 Your bed, however, is perfect for the weather you are experiencing and a "The Tudors" marathon. Hoping you achieve complete recuperation. Love your bed and headboard Scot! I've been thinking about a 'half-tester' above my own with two swing arm lamps and a padded headboard, and this post is inspiring. Well you know I love yours with the beautiful tartan. 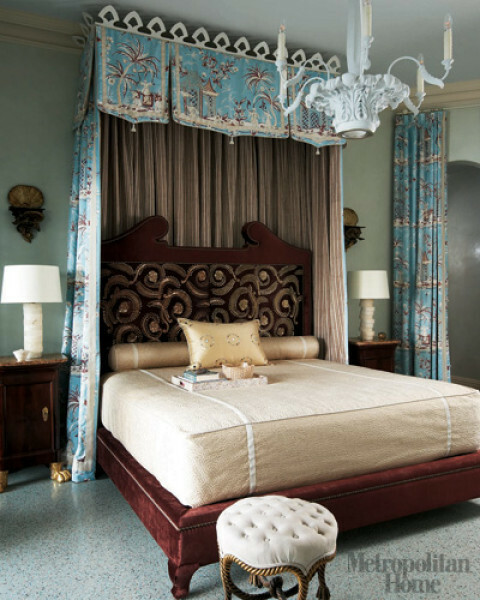 I also love the room by Miles Redd. Oh well, they are all beautiful. Have a nice, restful weekend. Scott: I'm a blog stalker. I always read your blog, but rarely comment. I had noticed your new bed a few days ago on your blog, and glad to see the whole room. This is genius. Very original, masculine, and successfully done. My sincere compliments! kindred spirit! I have poster beds in both my places. Toronto city one patterned after Anthony Todd's that appeared in ELLE Decor - do you know it? 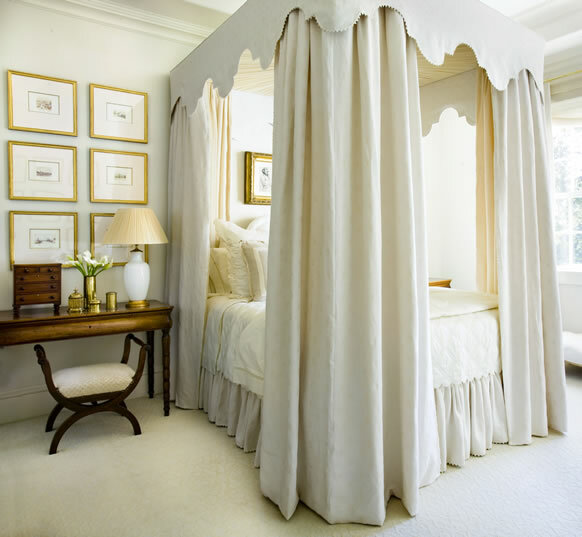 It did it just with iron drapery hardware - linen panels for warm seasons, linen + velvet for cold. In the country place it's the white painted IKEA Edland, plain simple and country. No bedhangings....yet. Of this collection I will pick yours 'cause of that killer headboard design - bravo! 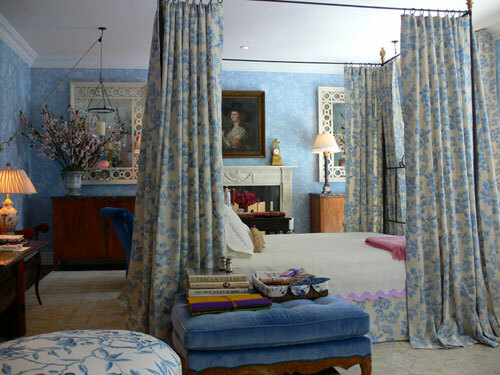 And Charlotte Moss's -- a touch girly for my liking, but I happened to make it to the Kips Bay house that year so having seen it in person gives it high marks. I'm tip toeing by your door...nothing better than a good nap. With beds like that, who cares what's going on outside! Your SF bedroom design is stunning! The white one..and the last..like them all.. I think this is the first time I've seen your whole room...how do you ever leave it! ?